As a detail-oriented minimalist, finding the best way to carry your belongings while traveling is a real struggle. Most suitcases and bags require you to stuff everything in with little compartmentalization. Genius Pack understood this struggle, which is why they decided to create the award-winning Genius Pack G4 Carry-On Spinner Case. Combining the perfect amount of durability, lightweightness, and organization, the Genius Pack G4 Carry-On Spinner Case is the perfect suitcase for the frequent traveler. In fact, this case was even awarded the title of Best Carry On Bag by Travel & Leisure and Fodor’s Travel! 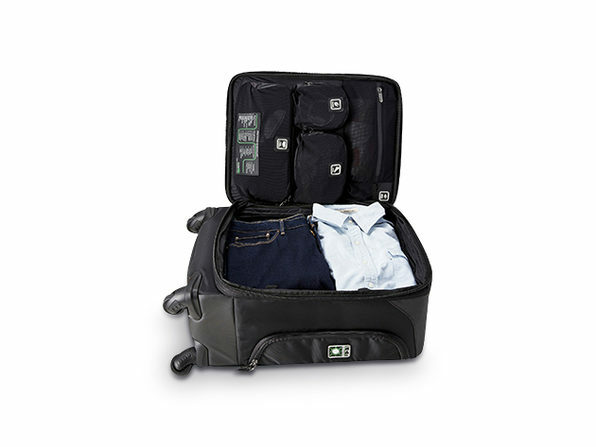 What makes these suitcases truly special is their patented Laundry Compression Technology®. Not only does this technology provide an easy method of keeping dirty close separate from clean ones, but it also allows you to compress clothing by up to 50%. Each Genius Pack G4 Carry-On Spinner Case is designed with a new luxurious polyurethane coated fabric. This material looks sleek and serves as durable protection for your belongings. Inside, you’ll find many designated compartments to keep various articles of clothing, toiletries, and technology separate. Be sure to take advantage of our amazing Cyber Monday deal. Originally, the Genius Pack G4 Carry-On Spinner Case was 43% off the original price. Use coupon code, CMSAVE20, to get an additional 20% off!